Look what arrived in the mail today! How a little spongy thing can brighten up my day is one of perks of being a crazy an incurable beauty addict. Look at the packaging! It sits like a diamond, but it's so much more intriguing. 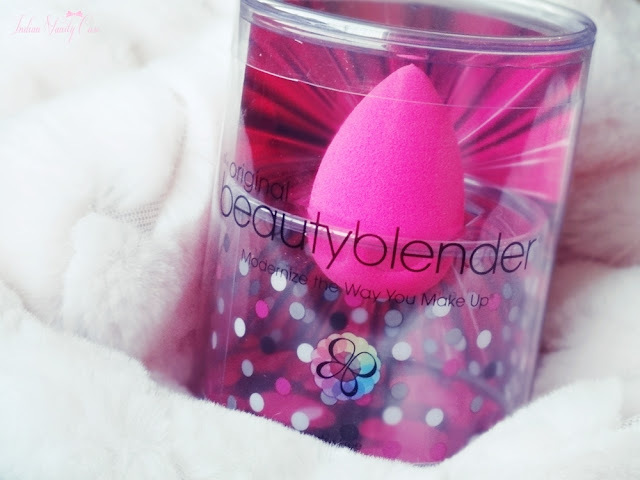 What it is: It's simply a makeup blending sponge. It was featured in a post here. Price ~ £14.99 | Rs.1474 from Amazon. They've hiked up the price now to original price, £16.50 | Rs.1622. I'm going to use it right away! Everyday. Until I can tell you, without a doubt, whether it's worth the hype or not. Really looking forward to it's review. I have heard A LOT about it. CZ, I am really going to purchase it if it's worth the hype..So waiting!!! omg and it's pink. I love it!!!! why can't they launch in INDIA....much needed. It is worth the hype! I have two and I've dumped every brush/other applicator I own for foundation, primer and even skincare. The dupes are awful. The Blender people are launching eye brushes called Detailers later this year and once those are out, I'm dump the eye stuff too, their product is that good! Hope I'll love it too!!! I must tell u...its the best buy ever! I've had it for a while now n totally in love with it !! I can imagine you jumping all over it ;) I want to try the make-up sponge from RT. They seem to be priced reasonable! Wow! Is this better than a brush (such as the RT Buffing Brush)? I gots to know! Will see and compare one day! I have been hearing about this a lot too! Wish I can get my hands on it. Ya, the black one looks nice too!